"Easy, authentic Mexican recipe that my mom taught me. 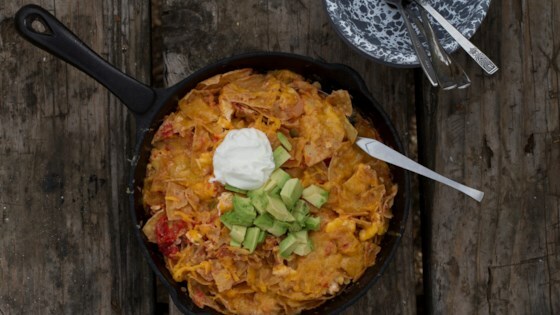 It's a casserole of tortilla chips mixed with eggs and salsa, and topped with cheese. Serve with refried beans." In a large, heavy skillet, heat the oil to 350 degrees F (175 degrees C). Carefully stir in the onion and tortilla strips. Fry until tortilla strips are crisp and golden brown. Remove from heat, and drain on paper towels. Drain the skillet, leaving only a thin residue of oil. Over medium heat, return tortillas to the skillet, and stir in the eggs. Season with salt. Cook and stir until eggs are firm. Mix Mexican style hot tomato sauce and water into the skillet. Reduce heat, and simmer until thickened, about 10 minutes. Top with cheese. Continue cooking until cheese has melted. I make Chilaquiles for hangover mornings. Works everytime. Love it!